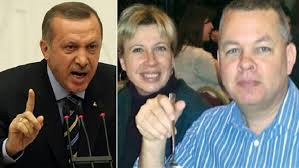 ANKARA, TURKEY (BosNewsLife)-- A Turkish court has rejected an appeal for American pastor Andrew Craig Brunson to be released from house arrest while being tried on terrorism charges. The announcement came shortly after President Tayyip Erdogan warned that Turkey would “go its own way” if U.S. President Donald Trump imposed sanctions over Ankara's refusal to free the pastor. Erdogan spoke amid an escalating diplomatic dispute involving 50-year-old Brunson. The evangelical pastor was arrested in December 2016 and jailed until he was released to home detention last week. Last week, President Trump announced possible sanctions against Turkey, a crucial ally of the NATO military alliance, for its treatment of Brunson. But in a reaction, Erdogan made clear that the pastor will be tried on espionage and terror-related charges. “They cannot make Turkey back down with sanctions,” Turkish media quoted Erdogan as saying. “The U.S. should not forget that unless it changes its attitude, it will lose a strong and sincere partner like Turkey,” Erdogan warned. Pastor Brunson, who is originally from Black Mountain, North Carolina, has lived in Turkey for 23 years and led Izmir Resurrection Church. He has denied wrongdoing. His ongoing detention has prompted his wife Norine to urge prayers for a "turnaround". U.S. Vice President Mike Pence reiterated this weekend that there would be consequences if Erdogan’s government did not free Brunson and drop the charges. “Transferring Pastor Andrew Brunson to home arrest is just not good enough, and the United States of America is prepared to bring sanctions against Turkey until Pastor Andrew Brunson is free,” Pence said in a television interview. Erdogan denied speculation that there had been an agreement to swap Brunson for Turkish citizens being held abroad, particularly 27-year-old Ebru Ozkan. Ozkan had been detained by Israel on terror-related charges but was deported this month. The Turkish leader previously linked Brunson’s return to the U.S. to the extradition of Fethullah Gulen. Ankara blames Gulen for the coup attempt, while the cleric denies involvement. Brunson's case has also underscored international concerns about the plight of the estimated 200,000 devoted Christians in Turkey, a mainly Muslim nation. "In Turkey, a mixture of Islam and fierce nationalism leads to Christian persecution. Turks are expected to be Muslims, a conviction that’s fostered by the government in a ploy to consolidate power," said the respected Open Doors advocacy group in a recent assessment. Several Christians, including church leaders and missionaries, have been targeted and even killed in recent years by extremists, most notoriously in 2007, when a German and two Turks were stabbed to death at a Bible publishing house in Malatya.